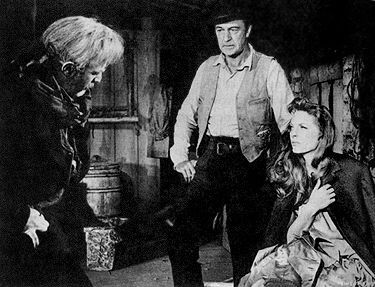 Lee J. Cobb, Gary Cooper, and Julie London in Man of the West. After being thrown from a train and losing the savings of the town he represents, downcast Linc Jones (Gary Cooper) and his newfound companions -- school teacher turned saloon singer Billie Ellis (the beautiful Julie London) and cardsharp Sam Beasley (Arthur O’Connell) -- stumble across the wilderness to an isolated ranch house. "Still standing," Cooper intones with troubled melancholy, and then he confesses to Billie about his younger self, "I don’t know what I was." In Man of the West (1958), Cooper represents another one of director Anthony Mann’s darkly troubled heroes, a man with a sordid past who used to run with the notorious Doc Tobin gang, robbing banks and helping the crazed old man kill people. Linc thought he had left the past behind, but suddenly in the middle of the wilderness he discovers that it is alive and must be destroyed. Once Linc stumbles into the house and bumps up against old Tobin (played with zesty bombast by Lee J. Cobb), Cooper, to protect Miss Ellis’ honor, pretends to want to rejoin his old, vicious gang. But when Doc, in a drunken haze makes a play for Billie, Cooper’s goodness brims to the surface. With forthright calm, he insists, "She’s mine, Doc." Billie, touched by his act of kind respect, cries on his shoulder and becomes the sympathetic woman to whom he can talk about his troubled past and the expectations for his reformed future. However, the twist in Man of the West, as in so many of the Anthony Mann/James Stewart pairings, suggests that Linc’s meanness has never really left. His new, respectable-civilized-citizen-of-Good-Hope-self is more veneer than full grain finish. After watching gunman Coaley (Jack Lord) make Billie strip down to her petticoats, and fending off the lusty advances of Doc, Cooper, much to his own dismay, confesses to Billie, "I feel like killing . . . like a sickness has come back. I want to kill every last one of the Tobins and that makes me just like they are." And in a later vicious fight with Coaley, Linc almost fulfills his dark fantasies. He humiliates Coaley, stripping him first, and then, enraged, he almost strangles his weak foe, but he can’t. Unlike Tobin’s son, Claude (played with steely calm by John Dehner), Cooper can escape his demons. But it’s those very demons that make Man of the West so compelling. Cooper’s portrayal of an edgy hero resonates with the 1950’s Cold War climate. Linc Jones is a different man from Will Kane in High Noon (1952). Will Kane has no personal demons. He’s a mythic figure of honor walking upright in a world corrupted by greed and selfishness. Allegorically, Will Kane represents the good American walking in a world on the verge of collapse from within. Communist overtones abound. But in Man of the West, Cooper’s westerner more fully embodies 1950s masculinity and the warring forces--good sheriff and bad townsfolk.